BELLEVUE, Washington -- A team of leading marine scientists from around the world is recommending an end to most commercial fishing in the deep sea, the Earth's largest ecosystem. Instead, they recommend fishing in more productive waters nearer to consumers. In a comprehensive analysis published online this week in the journal Marine Policy, marine ecologists, fisheries biologists, economists, mathematicians and international policy experts show that, with rare exceptions, deep-sea fisheries are unsustainable. The "Sustainability of deep-sea fisheries" study, funded mainly by the Lenfest Ocean Program, comes just before the UN decides whether to continue allowing deep-sea fishing in international waters, which the UN calls "high seas." "The deep sea is the world's worst place to catch fish" says marine ecologist Dr. Elliott Norse, the study's lead author and President of the Marine Conservation Institute in Bellevue, Washington USA. "Deep-sea fishes are especially vulnerable because they can't repopulate quickly after being overfished." The deep sea provides less than 1% of the world's seafood. But fishing there, especially bottom trawling, causes profound, lasting damage to fishes and life on the seafloor, such as deep-sea corals, these experts say. "Because these fish grow slowly and live a long time, they can only sustain a very low rate of fishing," says author Dr. Selina Heppell, a marine fisheries ecologist at Oregon State University. "On the high seas, it is impossible to control or even monitor the amount of fishing that is occurring. The effects on local populations can be devastating." "Fifty years ago no one ate orange roughy," said author Dr. Daniel Pauly, a fisheries biologist with the University of British Columbia (UBC). "In fact, it used to be called slimehead, indicating no one ever thought we would eat it. But as we've overfished our coastal species, that changed and so did the name." 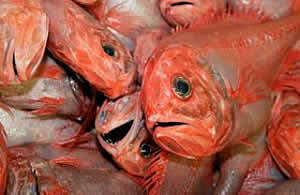 "Fishing for orange roughy started in New Zealand and grew rapidly through the 1980s and 1990s. However, most of the fisheries were overexploited, and catch levels have either been dramatically reduced or the fisheries closed all together," says author Dr. Malcolm Clark, a New Zealand-based fisheries biologist. "The same pattern has been repeated in Australia, Namibia, the SW Indian Ocean, Chile and Ireland. It demonstrates how vulnerable deep-sea fish species can be to overfishing and potential stock collapse." "Deep-sea fisheries can be sustainable only where the fish population grows quickly and fisheries are small-scale and use gear that don't destroy fish habitat," said Dr. Norse. "With slow-growing fish, there's economic incentive to kill them all and reinvest the money elsewhere to get a higher return-on-investment. Killing off life in the deep sea one place after another isn't good for our oceans or economies. Boom-and-bust fisheries are more like mining than fishing," Dr. Norse said. High seas trawlers receive some $162 million each year in government handouts, which amounts to 25% the value of the fleet's catch, according to Dr. Rashid Sumaila, an author and fisheries economist at UBC. "Instead of overfishing the Earth's biggest but most vulnerable ecosystem, nations should recover fish populations and fish in more productive coastal waters," says Dr. Norse. "Deep-sea fishes are in deep trouble almost everywhere we look. Governments shouldn't be wasting taxpayers' money by keeping unsustainable fisheries afloat."